Ikebana, Suzanne Edminster, gold metal leaf and acrylic on canvas, 15″ x 30″. This painting was part of a failed attempt to get into a local gallery. I was going to write a completely different blog today. But so many of my friends in the artistic community failed to get juried into our 2018 juried open studio tour, Sonoma County Art Trails, that I wanted to bring up the topic of failure and the dangers of branding. All four that I know are fine artists, with established reputations, patrons, and studios. Also, coincidentally, all are abstract artists or work outside traditional genre lines, and all are women. In America, we have a fetish for success. Our success-lust — there should be a word in German for this and there is, “Erfolgswunsch,”– leads us down many dark and sterile ways. Our movies worship the thought that if one works hard enough, makes enough sacrifices, you too can SUCCEED! There are genres of treacly, inspirational songs devoted to this notion. We Americans are suckers for this one. It has invaded our churches as prosperity theology, the notion that even God wants us to succeed at everything. God wants us to market ourselves. In this spin, the accusation is that if you have failed, you have simply not tried enough. You need to try again. And again. Apply to Art Trails again. Get in those ten thousand hours, loser. (Though those four women painters I mentioned already have put in their time to their art.) We need to re-examine our blind adherence to the try, try again philosophy. Tenacity is good. But what does it serve? The American dream of success promotes guilt, and it promotes throwing a lot of time and money out to enter the palace of fame and fortune. It promotes buying advice and spending more money to find out how you can get into the Academy, the gallery, the open studios tour– spend year after year applying and paying the fees to apply. Take marketing classes. Give money to get online courses and gurus. Brand yourself, baby. 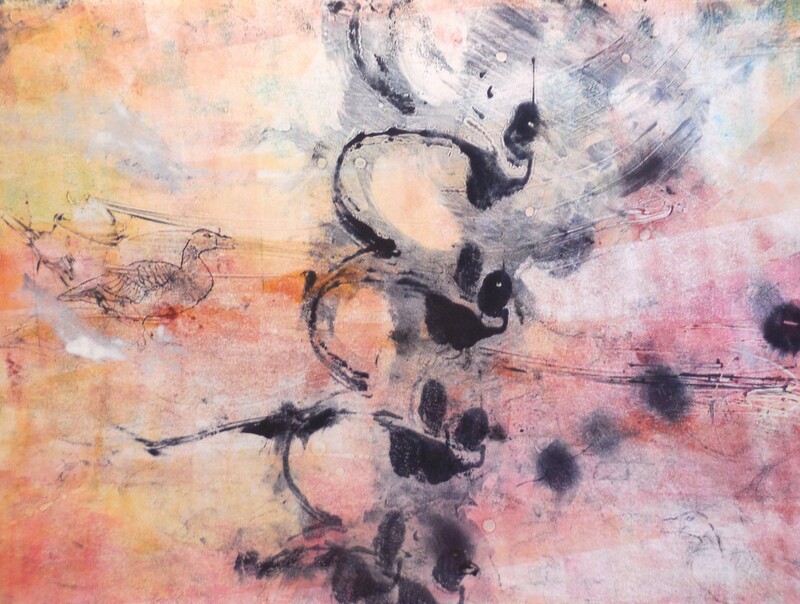 Goose game, Akua soy ink on paper, a failed monoprint. Part of the current propaganda of Succeeding is “branding.” My own connotations with the world are of pain, burning, slavery, hot iron and screaming calves, and ownership of cattle and humans. Branding involves creating a consistent image and not deviating from it. This means failure to conform to your own brand— say, an abstract painter deviates and paints vineyard landscapes– means that you have failed your brand. It is a failure within a failure, a double failure, failure squared. Loser! The problem is that in avoiding losing, in identifying with our own brand, we lose the chance for personal growth. Milton Glaser, in the video below, voices what artists have always known. It is a seven-minute video and worth your time. It’s also worthwhile using the link to his website, above, and taking a look at the series of his own quotes in the header. It’s no coincidence that in discussing failure, he brings up branding as an issue. Success, or personal growth? Milton Glaser managed both, an enviable trick. But difficult. I think everyone really needs to discover their own way through, and that takes reflection, and failure, not wholesale adoption of the images of celebrity and success our society promotes. The internet provides ways of crafting an individualized success that did not exist when I was a kid back in the the 1960’s. We only had print materials and TV. I had a childhood memory of the show Branded, the 1965-66 show starring Chuck Connors. The theme song seems, well, branded into my brain. It is a very scary theme song and image, showing a man stripped of all his honors, his good name, his sword, and his regimental family, cast out due to apparent desertion of his comrades. In fact, he is literally “drummed out” of the Cavalry, to the sound of military drums in the background. Branded! That’s not a way to die… what do you do when you’re branded, when you live with a lie? Thanks to Austin Kleon for his incisive thoughts and for providing the Milton Glaser video. And check out my summer painting classes at LocalsCreate, a new art venue in Geyserville. Metaphoracards is really fun and coming right up on May 29. I need two more people… if you are the first two to sign up online and email me about it, I’ll give you a free copy of Salt Licks and Bad Birds, my book. Just remind me about the book as I’m only offering it here in my blog. I’m teaching a 3 week series Wednesdays in June and July on abstract painting and a wild little class called Dream Figure Intuitive Painting on June 16. Email me at saltworkstudio@gmail.com with any questions. Thanks, Barbara. I like your Instagram feed. A great model. I liked the Milton Glaser video so much I posted it on my Facebook page. His is a short video but it’s chock full of wisdom. Thank you for sharing it. I think it is a classic too.